I’m sure you guys have seen pictures from my stay at La Zebra on my Instagram, but we took so many cool photos that I decided to bring them all together in a blog post. La Zebra Hotel is a total dream and I already miss it! It’s by the water (like most hotels in Boca Paila and Tulum Beach) and we were able to see the ocean from our room. Let’s start with the staff first since La Zebra excels at customer service. I stay at a lot of hotels – you guys know that – and Le Zebra’s team definitely stands out! We were greeted with margaritas at the lobby and were given a quick tour of the property by the friendly staff before settling into our room. After enjoying our margaritas on our amazing balcony (my favorite spot in our room), we decided to head to the beach to enjoy the water. It soon started raining but I honestly love the stormy season of this area. It’s scorching hot, but it can rain at any time, so it’s all part of the adventure for me 🙂 I think tropical storms are so romantic and unique. The ocean water in Tulum is a gorgeous turquoise color, and it’s warm so you can actually swim in it. Raise your hand if you think the Pacific Ocean is too cold 🙂 There are so many Instagrammable spots on the property, like the hammocks throughout the hotel, a spa with a secret garden, a hip beach bar, the comfiest beach couches and a huge relaxing area on the upper floor of the restaurant. There’s even a chic poolside bar which is right next to the ocean. Double points for planning a pool with a fantastic view! The property is rather small (one fact about me is that I hate big chain hotels)- which is another reason I love it so much here. It’s peaceful, relaxing and beautiful as well. It gets pretty dark at night time, which is a part of the concept, so make sure to use your flashlights that are attached to your room keys. Our room was so beautiful – boho chic design with a large mirror (every girl needs one! ), natural minimal bathroom area (but with a huge shower), and a super comfortable bed. You can watch the ocean while laying down, but the best part of the room is out on the patio. A super comfortable couch in one corner and a table and two comfy chairs on the other. And of course, the mesmerizing view of the ocean right in front of you. As a coffee addict, I was stoked to see that we had a Nespresso machine in our room! I use my Nespresso machine religiously when I’m home in San Diego and this detail helped me feel at home. They also left little Mexican desserts for us in the room, along with a Mezcal set. It’s all about the details, right? The hotel’s restaurant is one of the top ranked restaurants in Tulum (according to Yelp and other sites) and it deserves its title. We had breakfast, lunch, and dinner there multiple times. The restaurant manager and crew were all super helpful when it came to picking our dishes. I LOVE asking the staff what they recommend at every restaurant I go 🙂 Every single meal we had there was super delicious and colorful. We felt very spoiled! 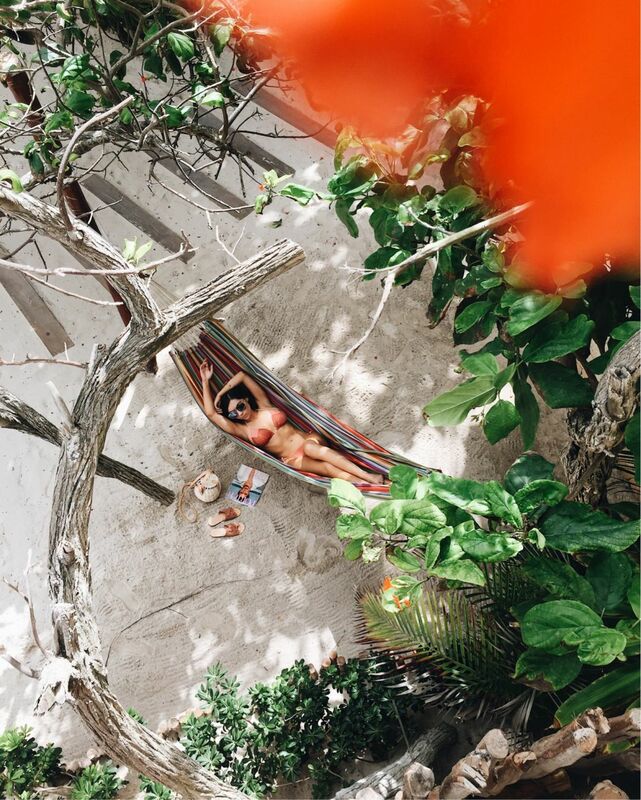 Tulum is known for organic eats and a healthy lifestyle, so no bloating after eating here! Feel free to eat as much as you want ‘cause everything is super fresh and tasty! La Zebra Hotel is a member of the Small Luxury Hotels of the World and is owned by Colibri Boutique Hotels, which owns four properties in Tulum and one in Nicaragua. I definitely want to stay at their other properties during my next visit to Tulum (I’m sure they will not disappoint) and I’m planning to visit their hotel in Nicaragua in the next few months! Each of their hotels offers a distinctive “barefoot chic” atmosphere and world-class gastronomy, appealing to all travelers who crave a taste of the best that life can offer. Has anyone stayed at any of the Colibri’s properties? What did you think? I’d love to know!